The Bose Triport Tactical Hedset is actually a rugged noise cancelling pair of headphones and I therefore HAD to play with them. My conclusions were however that these are useful if you want to hear both ambient noise and your radio (you can read my review here) simply because soldiers are meant to hear each other. This is its major difference with its little brother, the Bose Quiet Comfort 15 (QC15). The one I got was unfortunately broken: the speaker of the right ear cup was defective and although this part is not serviceable, it can still be swapped with a spare one (write-up in my other article here). This short article will describe the journey to make it work with a smartphone or walkie-talkie. The headset uses a AA battery but works with no battery in it. When switched on, ambient noise is repeated inside the headset. The volume is however adapted to remain within a safe range. If you decide to use a battery it will last many many hours. When connected to a compatible radio, Active Noise Reduction is active. It is however possible make it work unconnected. Note: both left and right channels are connected to the same pin of the connector, see below. Note: the circuit between the orange and GND wires are closed when the PTT button is pressed down (momentary) or up (latching). 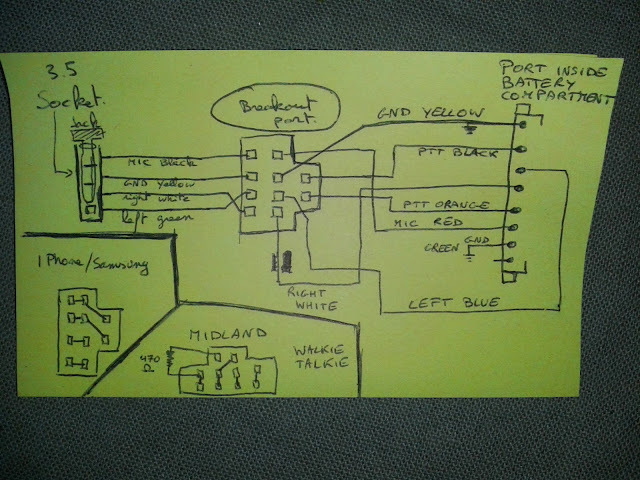 This is the pinout of the cable going from the radio to the battery compartment. The numbers correspond to the pin numbers inside the battery compartment (from left to right, holding the battery compartment with the cable to the headset up). 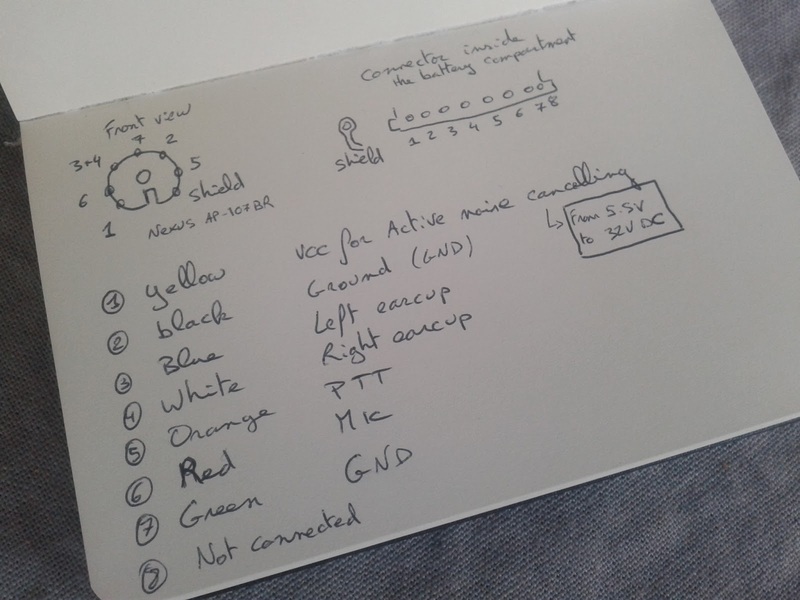 The picture of my notes on the above shows how these wires are wired in the connector (front view, with the contacts facing you as on the first picture above). This headset is stereo but has both channels connected to the same pin in the original radio connector. 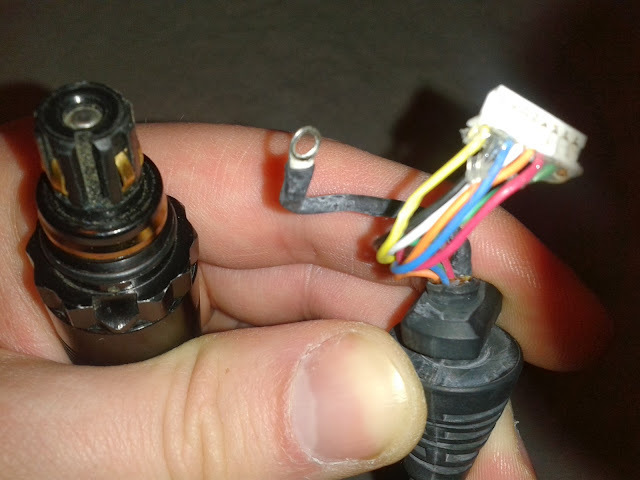 I am therefore going to get rid of that connector and place a new one. My objective is to connect it to a smartphone (and a Midland radio which has a different pinout). 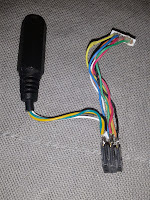 This headset is meant to be connected to a mono audio source and it is for this reason it has only one audio input on its connector (both the blue and white wires are connected to a single pin on the connector (see above). I had found this with some trial and error: both ears are connected to separate noise cancelling circuits each individually connected to the main box. Based on this observation I went a little deeper in the pinout analysis of the connector and noticed that the audio-in pin of the connector is actually connected to two pins in the control box... after removing the cable (used to connect the headset to the radio) and connecting an audio source to the GND and pin where the white wire came in I got sound in my right ear only Hurray ! I did the same with the pin for the blue wire and got sound in my left ear. the wire to the radio and the DC plug. Open the battery compartment ; this is where we are going to work. 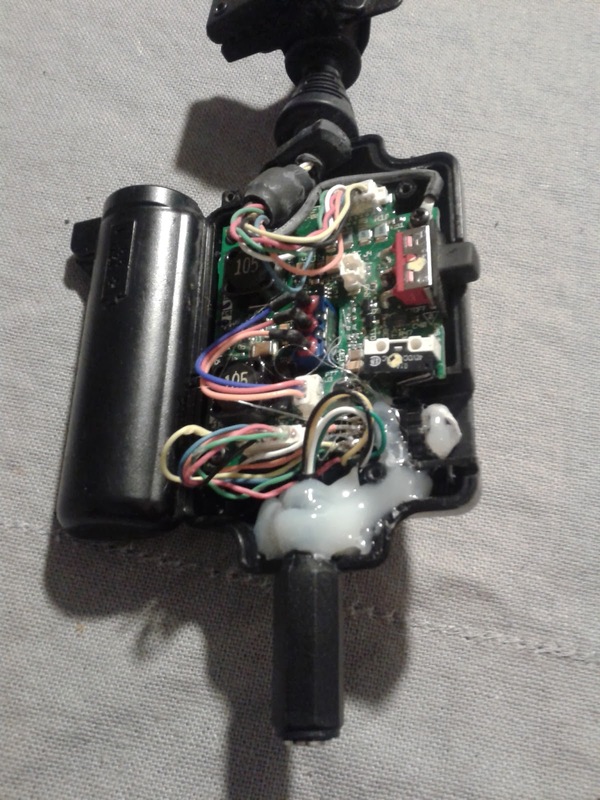 Remove the original wire intended to be connected to the radio (remove the silicone gluing it in place). 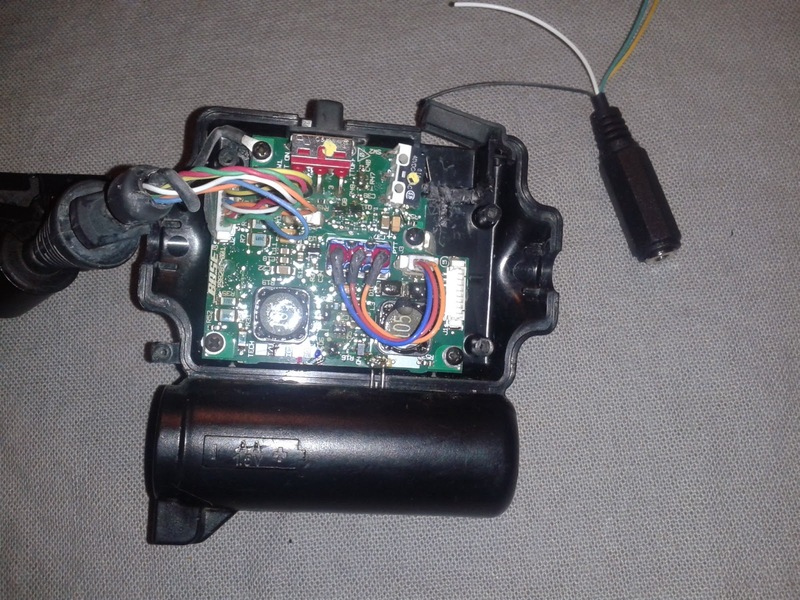 Below I will describe why I'm making extra room by removing the DC socket that is used to plug the headset in a combat vehicle. This room will be useful if you want to use standard cables and keep your headset versatile. I want to use a simple 4P 3.5mm male/male cable to connect my headset to my old Samsung phone. I want the PTT button to be useable with the phone but I also want to be able to use it with my Midland walkie-talkies. 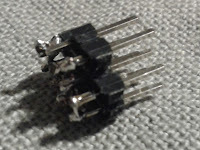 As you would have expected different devices come with different pinouts but usually have standard connectors (this is the reason why I used a 4P female 3.5 socket). While most smartphones use the following pinout: left, right, GND and mic (starting from the tip of the jack) Midland radios don't and I will therefore need an adapter. This is problematic since 470 Ohm between these pins will behave differently on a smartphone (previous track I think) and shorting the mic and GND will prevent the mic to work on a walkie talkie (or any other configuration, really...). This means you need to use a 6 pin connector on the headset to be able to wire all functions as you need them (left, right, mic, GND and 2 for PTT)... unless you decide to use a pin header to rewire them depending on the device you connect it to. The pictures below show the realisation of the diagram above. The 3.5mm 4P socket was recovered from a headset extension I purchased on eBay some time ago. The rest I just had lying around. Note that the hack here involves lots of hot glue to secure all components in position. It also comes with the advantage to make things waterproof. Note: This page provides valuable information on walkie-talkie pinouts, including Midland's. "The external microphone connection for an M42 protective mask is located next to the TTC switch. Using the external microphone connection automatically disengages the headset cable/boom microphone. This allows signal to be sent from the external microphone. 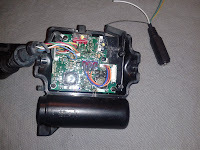 To access this connection, open the small hinged door near the switch and connect the M116/G microphone." If you do not provide vehicle power in, your headsets ANR will not function. You can still use the talk-through function via the onboard battery, but the ANR is powered through the vehicle. Its awesome I found your website, as I'm trying to do basically the same thing. 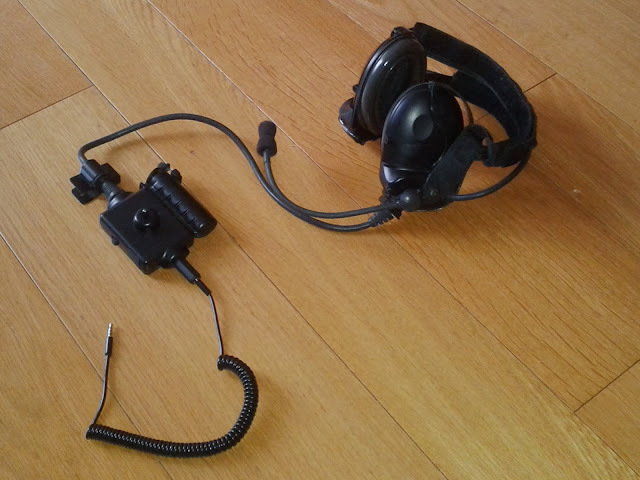 I want to use this headset as my Powered Paragliding headset to listen to tunes as well as connect to a small radio. I'd love your help figuring out how to make that happen! If you're interested, contact me at jrskola at gmail. 1) The yellow wire is not GND it is the VCC (5.5-32V DC) for the active noise cancellation. 3) The headset comes with active noise cancellation but it needs an external power supply (A DC step up could possibly be used). I'll update my post soon.